Green Springs features a line of furniture handcrafted in Georgia from wine barrels. The barrels originate mostly from California and France and each is unique. A group of crafters disassemble the barrels and create unique pieces of furniture guaranteed to start a conversation. These creations are durable--proud American craftsmanship from barrel and reclaimed pine--not imported particle board! 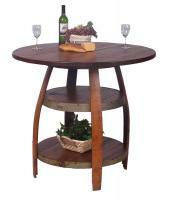 All of the furniture features wine staves, the sides of the wine barrel. The staves will vary due to the differences in the wine stored. Some barrels held white wine and the coloring inside the stave will mostly be a oak coloring. 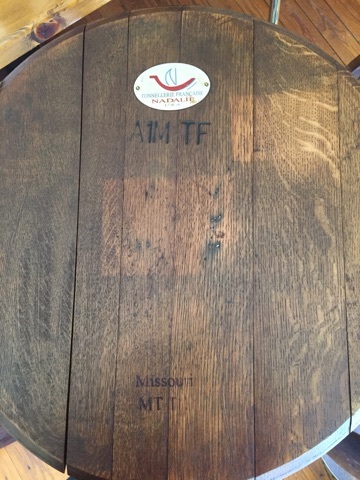 Some barrels will have had heavy red wines and will be a much darker color on the inside of the stave. Some barrels even feature charring--which is when fires have been set to the barrel--this leave a very dark color with some bubbling in the wood. These variation are part of the unique character of the furniture. No two will be just alike! If you are in the area, stop in and see what we have in stock! Not in the area? We ship and have very reasonable shipping rates! We offer very competitive pricing and ship all over the continental US! Below we list our best sellers. I own many of them--they last. My husband bought me the end table over a decade ago (long before Green Springs was open) and it still looks great. If you want a piece you've seen elsewhere (this furniture frequently appears in hip bars, magazines and on tv), or if you want to see other offerings, please email us! Stools feature wine staves for legs and a wooden seat crafted from reclaimed pine. Available in 24'", 26", 28", 30" or 32" heights. Each stool will vary--some barrels housed white wines, some lighter reds and some legs will feature charring--from heavy deep red wines. This charring--bubbling in the inner most layer of the wood-- adds a great deal of character to the stool yet will not impact the durability. 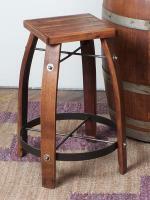 Our wood top stools, at any height are $199. Give us a call at 864-888-4327 to place your order--we will have it delivered to your door or you can pick up in store to save even more money by not paying for shipping! Shipping on these stools tends to be very low! Our best selling heights are the 26 and 28 inch. In my home, we have the 28 inch at our kitchen bar and the 26 inch paired with our bistro table at a large window. Enjoy date night at home. This cozy and unique table will sit two perfectly for a romantic evening of tapas and wine! This one is also great for in the wine cellar! With a wine barrel lid and stave legs with a reclaimed pine lower shelf, this table will set the tone for a nice evening. It is 35 inches high and 23 inches across the top. The bistro table is a romantic table. We dine at it when we're in the mood to sit and talk and eat little bites all night. Its a great table at a large window or in a cozy nook. My best selling table. I have owned one for over a decade and it still looks great! Mind you, in that decade I've owned it, we have had two rambunctious dogs, two cats and have moved houses four times. This table, while looking rich and regal, is a durable powerhouse! 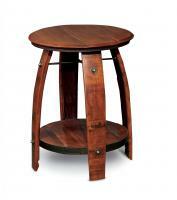 This table feature a wine barrel lid for the top and wine staves for its legs. The lower shelf on this table is reclaimed pine. 28 inches high and approximately 23 inches across the top. This table is for those who love our bistro table, but want to fit a few more friends around it! The top is rough sawn wood, 40 inches across. It features wine stave legs and two shelves. It will accommodate four stools. This is a grand table and will start many a fun evening. Want it in your house? Love the wine stave furniture? Who doesn't?! Want it in your house? That's easy. Give us a call--864-888-4327. We ship all over the continental US. Want 8 stools in Kansas? We've done that and will be happy to do it again! Want one table in Denver? Yep. No problem. Want a shipping quote that you can hold and read over and over? Want a quote that is competitive with the big boys out there selling similar furniture? Email us! alison@shopgreensprings.com We will happily provide a written quote with very competitive prices. Already have a price from someone else? Give us a shot at beating it--we usually can beat their prices because we are a small independent company--one owner no employees, no big chain of paper work here--this is why we frequently ship these table and stools all around the US--our prices are really good! When you're ready to buy, we can send you a PayPal invoice or take your order over the phone--whichever is easiest for you! Unlike some companies, we don't profit on the shipping---this is why we will need to quote shipping for you--we don't automatically write it in with a large safety margin!